Sinonasal undifferentiated carcinoma (SNUC) is an uncommon, highly aggressive, and clinicopathologically distinctive carcinoma of uncertain histogenesis. For most patients, there is no implicating factor although some studies have found that woodworkers and nickel factory workers are generally more susceptible to sinonasal malignancy of all types. Additionally, 85% of SNUC patients have been found to be current smokers or have a history of smoking. It is more commonly found in men and occurs over wide age range with a median presentation in a person’s sixties. Patients typically present with multiple symptoms such as nasal obstruction, epistaxis, proptosis, visual disturbances, facial pain and symptoms of cranial nerve involvement. Adjunct analyses (eg, immunohistochemistry, electron microscopy, and molecular biologic studies) are often required in the diagnosis of SNUC and in differentiating it from other undifferentiated malignant neoplasms. The prognosis associated with SNUC is poor, despite aggressive treatment, with a median survival of less than 18 months and a 5-year survival of less than 20%. Local recurrence is common and is a major cause of morbidity and mortality. The treatment of SNUC includes aggressive multimodality therapy, including surgical resection and adjuvant therapy (ie, radiotherapy, chemotherapy). Given the poor survival, it is important to go to a center with a high volume of sinonasal malignancy resections and dedicated sinonasal chemoradiotherapy center to give the best chance for survival. 71-year old female initially presents to her ophthalmologist who identified some cataracts for which she had surgery and this demonstrated some improvement. She was also seen by her dentist for possible TMJ. 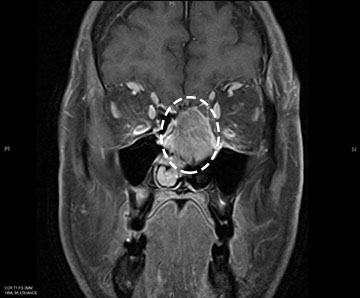 After this, the patients family member noticed right eye proptosis and a CT scan was performed, demonstrated a large sinonasal mass. From a sinonasal standpoint, the patient reports that she always has had longstanding nasal congestion. She recently had a small nosebleed but other than that, no significant bleeding. She also says her sense of smell has been poor. She has no history of any work environments that are related to a sinonasal mass. She was biopsied by a local doctor and the biopsy came back as sinonasal-undifferentiated carcinoma. She was taken to the operating room for a 2-stage procedure. First an endoscopic procedure to resect the tumor from the sinonasal cavity and off the eyes bilaterally. Given the clear margins here, the remainder of the tumor in the intracranial component was resected via a craniotomy. The patient stayed in the hospital for 4 days and then discharged home. She followed this up with chemotherapy and radiation therapy and is currently 1 year out from treatment with no evidence of recurrence. 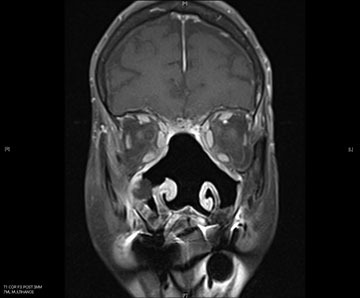 This is a 73-year-old male who initially presented 4 years ago with a 2-month history of facial pressure, left nasal obstruction and congestion and post nasal bloody discharge (bloody mucous draining down from the back of his throat). He did not have any episodes of epistaxis (nosebleeds) or facial numbness. Initially, he had no vision changes either but later reported his vision did become mildly blurred. 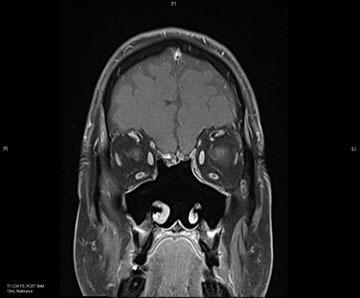 Outside CT and MRI scan suggested the presence of a tumor. A PET scan further indicated the presence of a tumor and pathology came back as a poorly differentiated carcinoma. 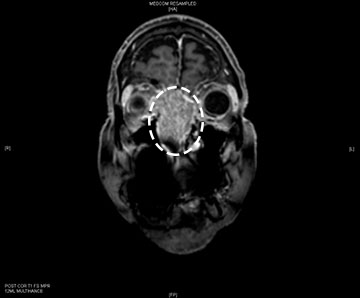 He underwent an endoscopic resection of the tumor through nose and sinuses by an endoscopic sinus and skull base surgeon. His surgery was followed by a cycle of chemotherapy and radiation therapy. He completed radiation therapy 4 years ago and has not needed further surgery. He follows up every 6 months with a new MRI to be reviewed. To date, there has been no evidence of recurrent tumor.